"The Cassini orbiter's path carries it near the outer edge of Saturn's huge but diaphanous ring system." "Astronomer Guillermo Gonzalez was doing some work on various eclipses in the solar system, so I did this image to complement that work. 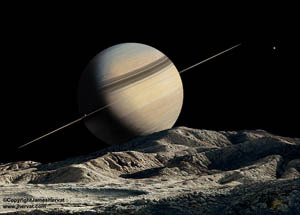 The piece was done before Saturn reached equinox, so we had not yet seen long shadows across the rings. 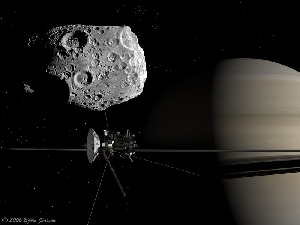 It was fun to try to imagine what would be coming up through the eyes of Cassini!" 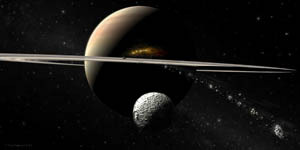 "Everything about Saturn and its moons fascinates me. Little Tethys is often overlooked, but has some spectacular scenery." 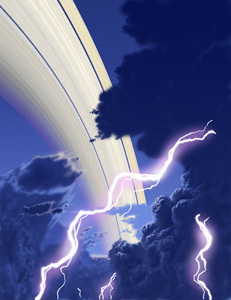 "I got tired of doing paintings of peaceful Saturnian scenes, so, when I learned about the violent storms that occur on the planet, I did this." "Saturn's 'Great White Spot' was first observed in 1876 and has reappeared at roughly thirty-year intervals since. 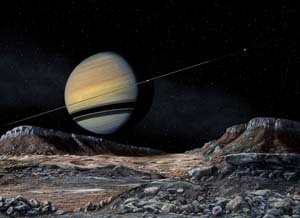 When it abruptly returned in 1990, the Hubble Space Telescope was hastily re-directed to Saturn and it revealed the 'Spot' to be a titanic disturbance that circled the northern half of the Equatorial Zone. "Since then I wanted to paint this event as seen up close, with Mimas in the foreground, but the project got put aside and I eventually decided to wait until Cassini got some better images of the moon. When that finally happened, I found myself almost overwhelmed by the exquisite detail in and around Herschel as revealed by the recent Cassini images. If not totally accurate, I hope the final result at least hints at the splendor of the event." "Saturn, as seen from the icy surface of Rhea." "In this image a large comet is intercepted by Saturn's gravitational pull on its way towards the Sun. 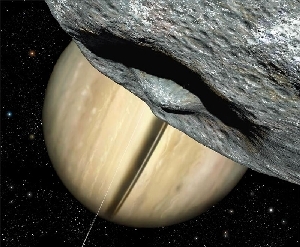 The tug of the planet tears the comet apart as it passes Mimas. 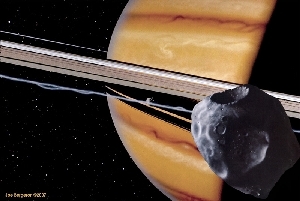 Pieces of the comet travel through part of Saturn's rings just behind Pandora and impact the fast moving atmosphere of the planet, vaporizing and releasing energy. 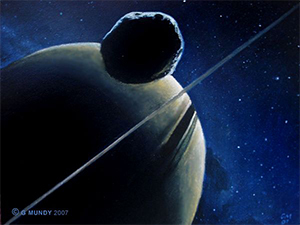 This piece was inspired by pictures captured by Cassini and was digitally painted using Corel Paint and Adobe Photoshop 4 on a Wacom board. (No photographic images were used to produce this piece)." "This is a 3D model rendered with Modo 401. The rings where painted in Photoshop and applied as a texture." 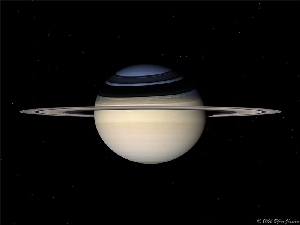 "Saturn showing the blue color of its winter hemisphere as discovered by Cassini." "Saturn's northern hemisphere and north polar region are prominent in this rendering, which has a 45 degree field of view. Note the hexagonal wave around the north pole, plus the many small storm systems and wavy features." 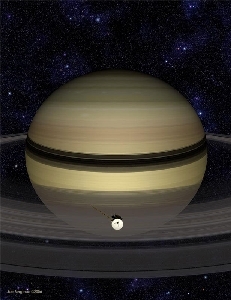 "Like a piece of exquisite jewelry, the Cassini spacecraft ornaments the rings of Saturn." 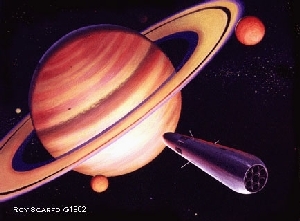 "An excursion to Saturn, the sixth planet, some 520 million miles from Earth, will be an exciting adventure. 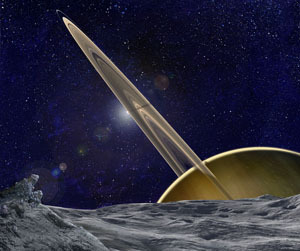 Flights through Saturn's halo, or rings, and around its moons would offer the traveler an experience not available anywhere else in the universe." 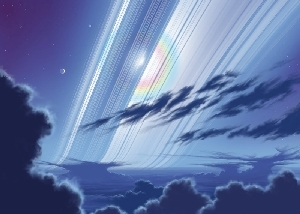 "Here is a view from Saturn looking up through cold high altitude clouds backlit by bright ringshine and moonshine." 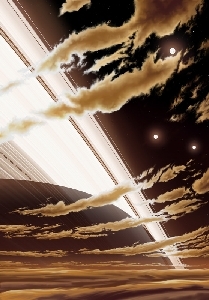 "An experimental rendering showing the rings from within Saturn's atmosphere. The altitude above the cloud tops is roughly 140 km, and the field of view is 40 degrees. The rings appear slightly bent near the horizon due to refraction. The refraction effect should be reasonably accurate, since I used Cassini's images of this effect as "ground truth" to verify that everything made sense. 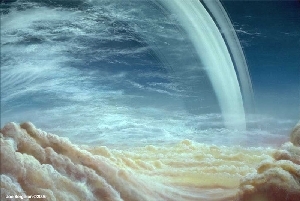 In contrast, the color and transparency of Saturn's atmosphere are only approximate. In particular, the atmosphere is probably less transparent than depicted here." "A Cassini inspired view of the moons Pandora and Prometheus orbiting on either side of Saturn's amorphous F ring. Further in, the smaller moons Pan and Atlas can be seen in their respective orbits." "The small moons Prometheus and Pandora twist and confine the particles of the narrow F ring, which orbits between them." 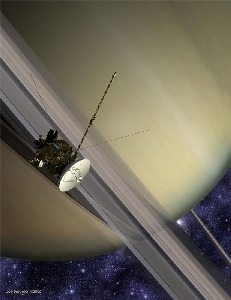 "The Cassini Orbiter, one of the most advanced spacecraft ever launched, cruises in the vicinity of the great planet Saturn." "The impact which created the giant crater Herschel must almost have shattered this tiny moon." "This is a view from above the polar region of the moon Tethys. Tethys' icy surface is punctuated with many craters and long, shallow canyons. 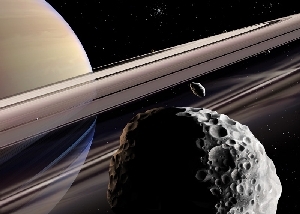 Tiny Mimas appears near the rings of Saturn." "Mimas' huge crater Herschel faces directly into the direction of orbit (90 degrees longitude), and 2 degrees south latitude. 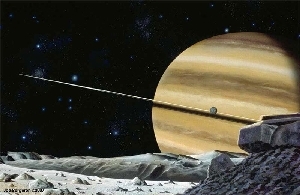 At that position, it has this view of Saturn, with rings extending vertically like a sword. Mimas, lies 1.5 degrees off the plane of the rings, so the rings appear as a thin ellipse rather than a razor-thin line as it does from other moons. 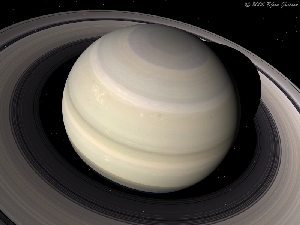 In this view, the surface is only lit from Saturn itself, which is illuminated from below and behind. Herschel's central peak rises in the center. 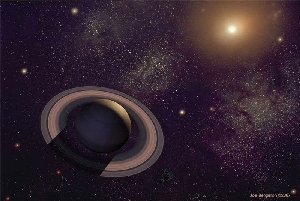 Saturn will always appear in the same place, just going through phases like our moon." "Mimas, innermost major moon of Saturn, has a huge crater on one side, named after the astronomer Herschel. 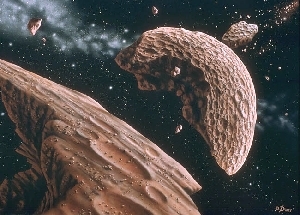 When first discovered, it was said that if the impacting body was a little larger, it would have broken up the small moon. Later it was hypothesized that this has, in fact, happened to the Saturnian moons. The painting shows us the possible aftermath of such an impact." "Cassini has yet to have an extremely close flyby of one of Saturn's small, irregularly shaped satellites. No such flyby is scheduled for Cassini's primary mission, so should one ever take place it would have to be during a possible extended mission. 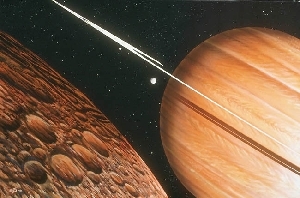 This rendering shows a fictional flyby of Calypso, one of Saturn's small satellites. In reality, Calypso's surface probably appears smoother than in this rendering. To better show instruments and individual components, the spacecraft is rendered without most of it thermal protection blanket." 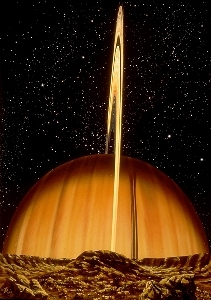 "This was my first serious foray into space art. 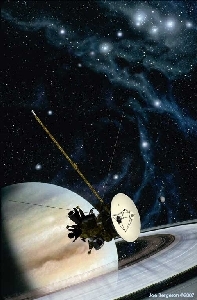 Done in 1982, I worked closely with the Voyager spacecraft imaging team on it. It shows a crater on the polar region of Dione, Saturn's fourth major moon. The white streaks are fissures filled with fresh ice from beneath, and were caused by a cometary impact on the reverse side of the moon. Dione is composed of water ice, and the surface gravity is so low, you could throw a rock into orbit." 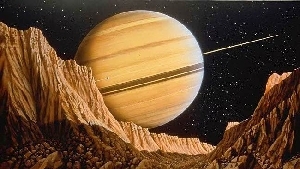 "On Dione, a moon of Saturn, the impact of an ancient comet has created a labyrinth of polar canyons called the Tibur Chasmae. From this location, Saturn will always appear near the horizon, and its rings will be seen as a thin band stretching along the equator." 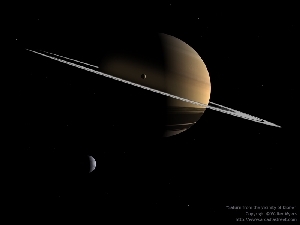 "Saturn looms large as seen from the big icy moon Rhea, with smaller Mimas in the distance." 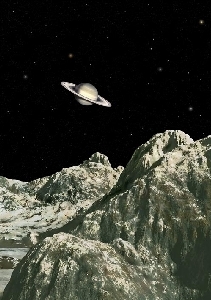 "This is how Saturn might appear from near Dione, one of Saturn's inner icy satellites. In this image, Dione is in the foreground orbiting about 197,000 miles above Saturn's cloud tops. 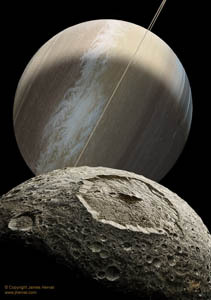 Further toward Saturn, at a distance of 50,000 miles from Dione is Tethys, another icy moon, slightly smaller than Dione. Tethys is silhouetted against the "ring shine" on Saturn's night side--reflected sunlight on the cloud tops from Saturn's rings." 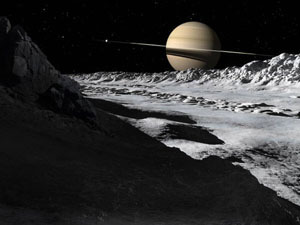 "Iapetus is the only major moon from which Saturn's rings may be seen quite wide open. Dark, organic material lies on the rocks." 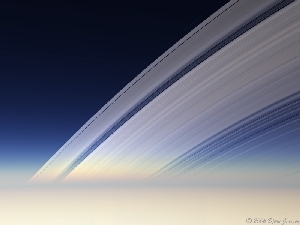 "Sunlight on the rings grows dimmer as the Sun approaches the ringplane of Saturn." 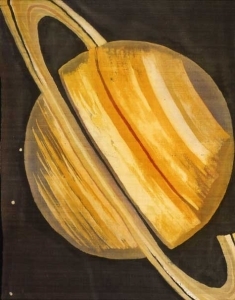 "This is a 43-inch x 36-inch batik on silk showing Saturn and its rings, which are formed of icy blocks the size of small cars and orbit the planet like many small moons." "This is a 32-inch by 54-inch batik on silk. The Hubble Heritage Team provided the picture which is the basis for this batik. 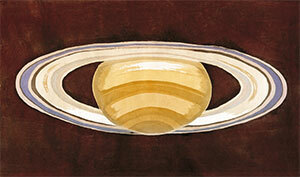 Four hundred years after Galileo's telescope saw Saturn's rings I am stunned at the sight we now have available."